Hill Poplar is a hardy, fast-growing tree with a narrow crown. Hill Poplars function well as a privacy screen or windbreak. This attractive, long-lived shade tree is a great choice for home and commercial consumers alike, as it requires little pruning or maintenance care. 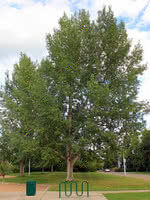 Hill Poplar has largely been replaced by more desirable hybrid poplar varieties that are more resistant to disease.